A presentation supporting a proposed $3.5 million levy to restore the Wood River Trail bike path was met with no opposition Wednesday at a forum in Hailey hosted by the Blaine County Democrats. Blaine County Recreation District Executive Director Jim Keating started the presentation by describing the reasons he thinks the levy is needed. Former BCRD Executive Director Mary Austin Crofts then followed with a statement of support. Keating described the bike path as an “artery” running through the community, a path that runs through more than 50 different easements from agencies such as the Bureau of Land Management and the Idaho Transportation Department, as well as the cities and Blaine County. “It’s a pretty unique recreational asset that connects the valley through non-motorized transit,” he said. 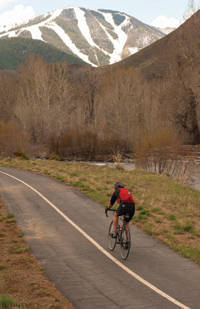 Keating cited a Blaine County Trails Study conducted last summer that showed the bike path received more than 350,000 trail-use days—half of the total number of trail-use days through the entire valley in the summer. The levy would be collected over two years, with $1.75 million collected each year, or about $21 per $100,000 of net taxable property value. Keating said the projects would also be split over two years, and crews would work from south to north in sections, mostly smoothing out the path’s surface and covering it with a new, recycled asphalt surface. Some areas of the path will require more repairs, Keating said, including some severe potholes near St. Luke’s Wood River Medical Center. The proposal does not include extension to Carey, but Keating said that project is still in development. The levy needs a simple majority to pass when it is on the ballot Tuesday, May 21. “I feel like I spent most of my adult life working to put this trails system in,” she said. Crofts was executive director of the BCRD for 20 years, including from 1984 to 1990 when the trail was built. She said one of the things that motivated her to work on the system was watching children ride their bikes on state Highway 75 from Bellevue to Hailey to swim in the then-newly-built BCRD pool. Hailey resident Kathy Baker said she and her three children use the bike path all the time in the summer as a safe, efficient way to get around town. No one at the forum—attended by about a dozen people—spoke against the levy. Crofts said she is not aware of any organized opposition to the vote. “But it’s never over until the election is over,” she said.